Small Industries Development Bank of India (SIDBI) invites online applications for recruitment of Specialist Officers in Grades ‘A’ and ‘B’ and Consultant (Merchant Banking) – 2016. Candidates are advised to apply ONLINE, through Bank’s web site at www.sidbi.in after carefully going through all the instructions contained in this application and general instructions given in this advertisement. Nationality / Citizenship: A candidate must be either (i) a citizen of India or (ii) a subject of Nepal or (iii) a subject of Bhutan or (iv) a Tibetan refugee (who came over to India before 1st January 1962) with the intention of permanently settling in India or (v) a person of Indian origin who has migrated from Pakistan, Burma, Sri Lanka, East African Countries of Kenya, Uganda, the United Republic of Tanzania (formerly Tanganyika and Zanzibar), Zambia, Malwi, Zaire, Ethiopia and Vietnam with the intention of permanently settling in India. Provided that a candidate belonging to categories (ii), (iii), (iv) or (v) above shall be a person in whose favour a certificate of eligibility has been issued by the Govt. of India. Candidates age should be not below 25 years and not exceeding 35 years for Post 1, not below 21 years and not exceeding 28 years for Post 2, not below 24 years and not exceeding 32 years for Post 3, not below 21 years and not exceeding 28 years for Post 4, not below 35 years and not exceeding 55 years for Post 5. Age relaxation is 03 years for OBC Candidates, 10 years in upper age limit for PwD (unreserved), 13 years for PwD (OBC) and 15 years for PwD (SC/ ST) candidates is admissible as per rules. Minimum 10 years in Financial sector /Law firms along with 5 years experience working with SEBI recognised Category-I Merchant Banker handling issue Management, Merger, Acquisition, Listing, De-listing, ESOP Valuation, Project Appraisal, Loan Syndication, etc. A Pass in Typewriting Higher/Senior Grade Examination in English conducted by State Board of Exam/Board of Technical Examination/ Board of Technical Education and Training. Candidates should possess Post Graduation Degree in Economics from a recognised University. Candidates should have excellent communication and writing skills. Interview only for Consultant (Merchant Banking) Post; Online Examination and Personal Interview for Group A Posts; Online Examination, Group Discussion (GD) and Personal Interview. Rs.50/- (Intimation Charge Only) for SC/ST/ PWD; Rs.500/- (Rs.450 for Application Fee, Rs.50/- for Intimation Charge) for General and OBCs; No fee for Staff Candidates. The payment can be made through Online Payment (by using Debit Cards (RuPay/Visa/MasterCard/Maestro), Credit Cards, Internet Banking, IMPS, Cash Cards/ Mobile Wallets) during Online Registration. 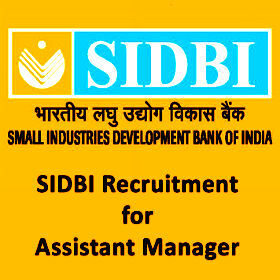 Candidates to go to the SIDBI website www.sidbi.in – click on the option “APPLY ONLINE” which will open a new screen.